Lithium producer Galaxy Resources is planning to be operating West Australia’s first mine powered by 100% renewable energy within 3 years. The mine is already partially powered by solar panels mounted on solar-trackers. 10 to 15% of the energy for the Mt Cattlin lithium mine, 540km south of Perth in Ravensthorpe, comes from on-site solar tracking panels developed by Swan Energy, which follow arc of the sun through the sky to produce up to 15% more power than traditional fixed-axis panels. The power to close the gap for energy currently produced by coal and diesel will come from three wind turbines–1.2MW each, to take advantage of the area’s strong, consistent winds–and a 1MW solar power system. Most mines in WA presently use diesel to power their operations. Diesel, as a fossil fuel, emits carbon dioxide, and under a carbon tax would be a significant liability for ‘big polluters’ such as power generators and mining companies. The preemptive move by Galaxy Resources to source all of the mine’s energy from renewable sources was motivated in part to protect itself against the financial repercussions of such a tax, but also as good PR for an industry not known for being environmentally friendly. 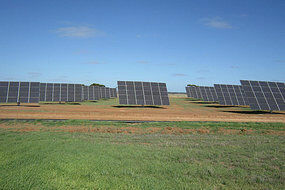 Other mining companies are also said to be considering their options for renewable generation. Swan Energy managing Director James Rhee says that he expects the focus of his business to move from schools and public sector to the resource industry within a few decades.